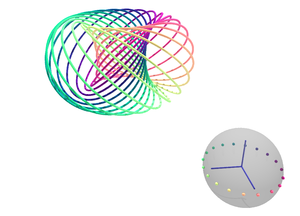 The Hopf fibration shows how the three-sphere can be built by a collection of circles arranged like points on a two-sphere. In this animation we see specific points on the two-sphere synchronized with the circles (fibers) over them. The animation has been choreographed to demonstrate a number of special properties related to the symmetry and beauty of the three-sphere (see below); I hope you enjoy it. If you want, you can watch Niles explain the Hopf fibration to the UGA Math Club. Warning: That talk is about an hour long, so get your popcorn ready! Each fiber is linked with each other fiber exactly once. This is the property that first attracted attention to the Hopf fibration, and a pair of circles in this configuration is called a Hopf link. 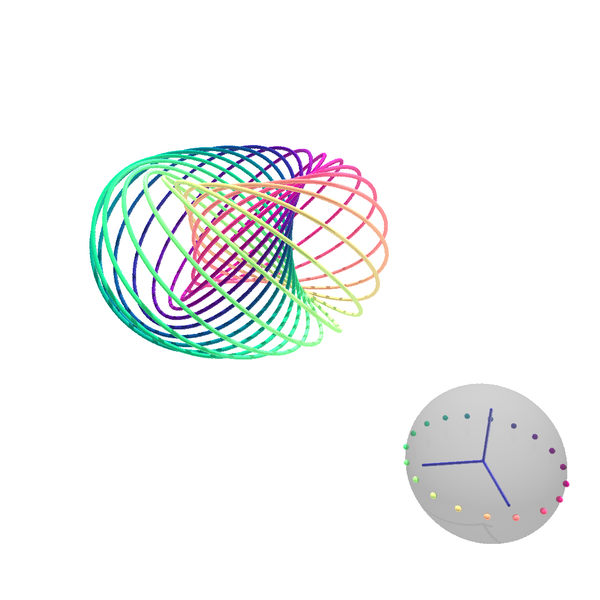 The collection of fibers over a circle in \(S^2\) is a torus (doughnut shape), \(S^1 \times S^1\), and each such pair of tori are linked exactly once. The collection of fibers over an arc form an annulus whose boundary circles are linked. This is known as a Hopf band; it is a Seifert surface for the Hopf link. The Hopf link is a fibered link: it has a family of Seifert surfaces parametrized by the circle, \(S^1\), whose interiors are disjoint. The fibers over lines of lattitude form nested tori. The three-sphere is a union of two solid tori, joined along their boundary. This boundary is the torus of fibers over the "equator" on \(S^2\). One solid torus is formed by the fibers over the Southern hemisphere, and the other by the fibers over the Northern hemisphere. The Hopf fibration is a kind of projection from the three-sphere to the two-sphere. The two-sphere is the one you're likely to be familiar with—a beach ball is a good example. The two-sphere is formed by all points which are a constant distance from a center point. We write the two-sphere as \(S^2\) to indicate that it is 2-dimensional. 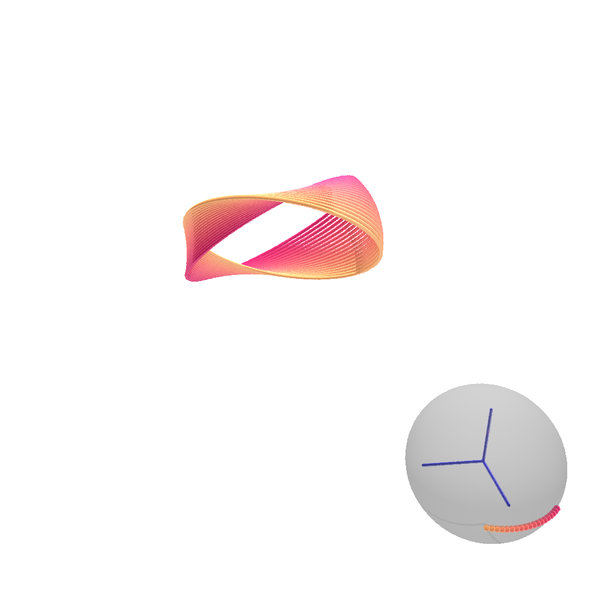 Collapsing the boundary of a 2D disk to form a two-sphere. The three-sphere, \(S^3\), is an object in four-dimensional space formed by all points which are a constant distance from a center point. 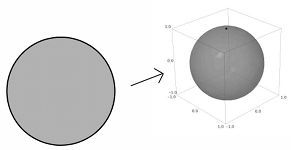 In the video, we represent \(S^3\) as a solid 3D ball, with the understanding that its entire boundary must be collapsed (in four dimensions) to just one point, without collapsing its interior. 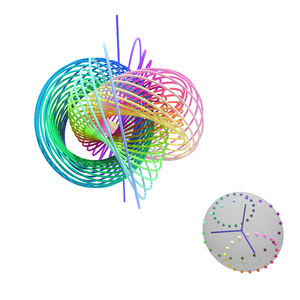 This is similar to the way one forms a two-sphere by taking a solid 2D disk, blowing it into a 3D bubble, and pinching the boundary circle to a point. This is the inverse of a modified stereographic projection. 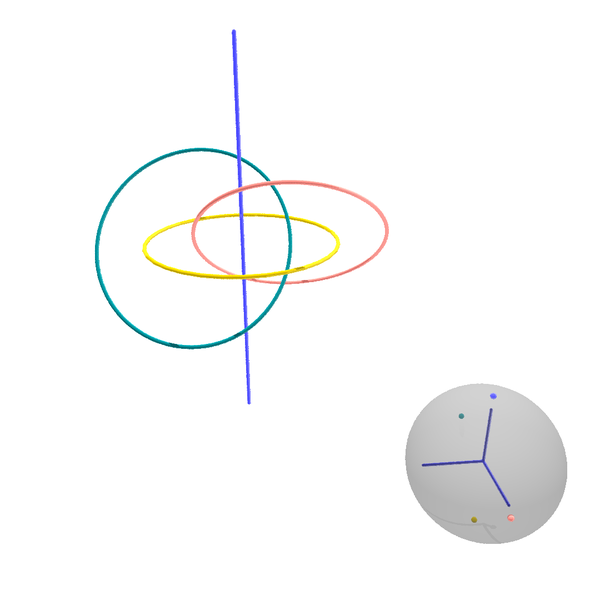 Points on the two-sphere (bottom right), and their fibers in the three-sphere. The three-sphere is challenging to visualize. One of the goals of this video is to help you do this! 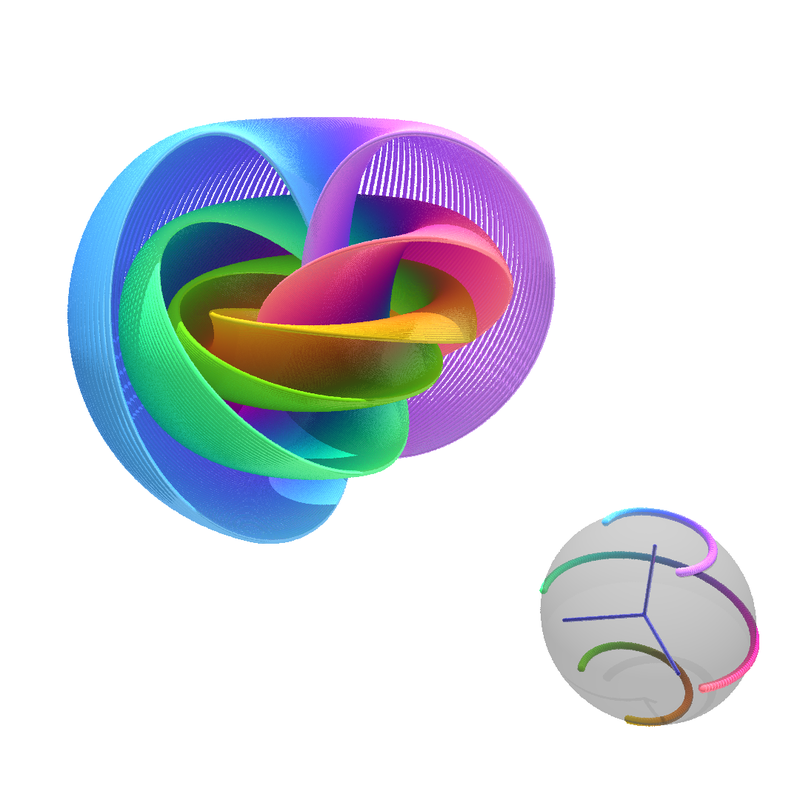 The Hopf fibration shows how the three-sphere can be projected down to a two-sphere in an organized, symmetric way. The fibers in a fibration are the parts that project to a single point. In the Hopf fibration all the fibers are circles. 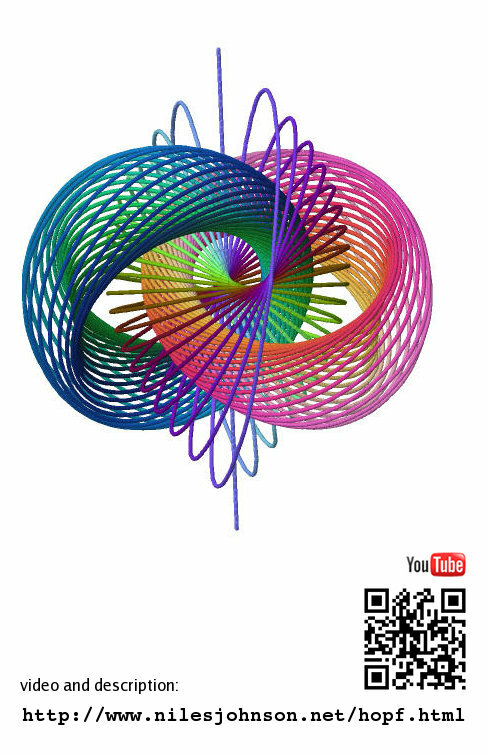 For the video, each point on the two-sphere has been given a distinct color and the circle which projects to it is drawn in the same color. The only fiber that doesn't appear as a circle is the blue vertical line through the center of the ball. Remember that the three-sphere is formed by pinching the entire boundary of the ball to a single point. 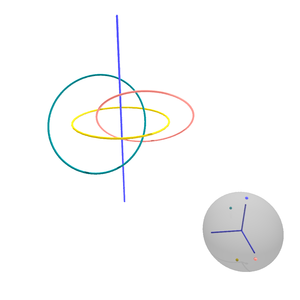 The two ends of the line lie on this boundary, meeting to form a circle in \(S^3\). Some people like to think of this as a circle through "infinity". Shown below are three circles on the two-sphere and the corresponding fibers, forming three linked tori in the three-sphere. The Wikipedia article about Heinz Hopf (1894 – 1971), after whom the fibration is named. A drawing of the Hopf fibration by artist Lun-Yi Tsai. 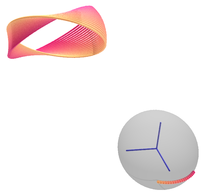 An introduction to higher-dimensional spheres, complex numbers, quaternions, and the Hopf fibration: A young person's guide to the Hopf fibration, by Zachary Treisman. A more in-depth introduction to the Hopf fibration, geared toward college students in math: An elementary introduction to the Hopf fibration, by David W. Lyons. An essay on the Hopf fibration introducing its relation to quantum mechanics: Hopf fibration, by Hongwan Liu; from a collection of student essays for a topology course. Fiber bundle twist reduction, by Ken Shoemake: An article on using the structure of the Hopf fibration to improve the way a camera tracks an object in 3D animation (Graphics gems IV. Edited by Paul S. Heckbert, 1994). Ken Shoemake's picture of the Hopf fibration. My interest in the Hopf fibration was sparked by Ken Shoemake's picture, donated to the Hopf topology archive. This was one of my first experiences with topology and I've been fascinated by the subject ever since. All of the software used for this animation is open-sourced and available on a variety of platforms. 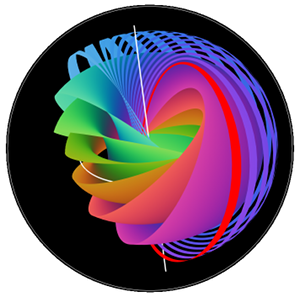 The Python-based mathematics program Sage was used for determining the fiber parametrizations and keeping track of all the animation data. Sage provides an interface to the ray tracing system Tachyon, and this is what produced the individual frames. The music was edited with Audacity. To stich the frames into an animation, I used FFmpeg, a full-featured program for working with audio and video in a broad range of codecs. The frames for this animation were rendered on the high-powered machines made available by Jonathan Hanke at the University of Georgia, and I'm extremely grateful for this support. Raytracing the final product took 24 modern processors about 40 hours. For additional technical details and a copy of the source code, take a look at the production notes. Interested in a poster for your wall? I have just the thing! It includes a QR code and a text link, and is proportioned to work especially well for printing 2-up on letter/A4 paper.